Brown sugar coconut chocolate bars are rich, sweet, gooey goodness from top to bottom. Perfect for dessert or a sweet treat any time. These brown sugar coconut chocolate bars are from Easy Does It: Winners & Favorites by Patti Roper. It’s a cookbook filled with traditional Southern recipes like Pimento Cheese, Creole Catfish, Peach Muffins, and these Brown sugar bars. Simple ingredients that should always be in your baking cabinet, make these treats a delight to share with friends! Here’s the recipe for the brown sugar coconut chocolate bars. If you make them, please come back to leave a comment. I’d love to hear what you think of the recipe! Press half the dough into greased, and foil covered pan (this one is 8 by 8 inches). Sprinkle mini chocolate chips. Roll the other half of the dough to fit on top and press down. 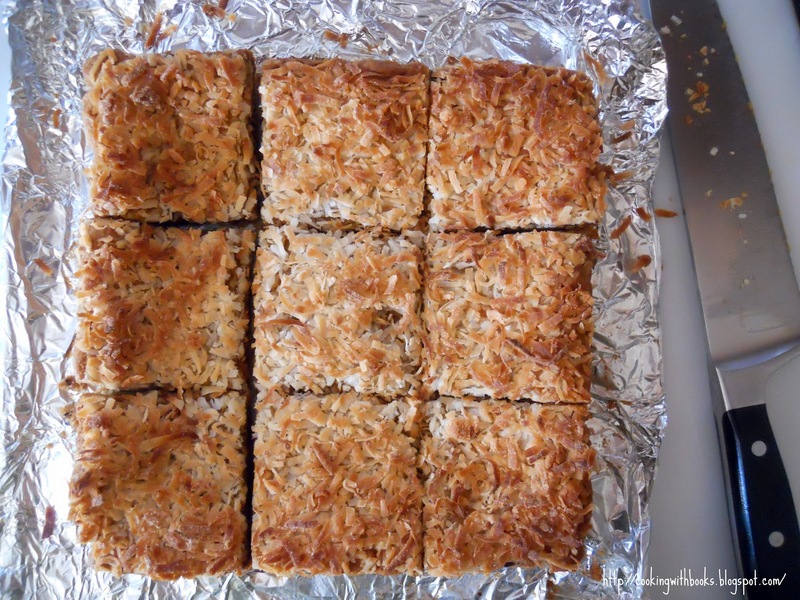 Bake 30 minutes, until coconut is toasted and bar is fully baked. Cool for an hour or overnight for clean cuts. *This recipe could yield 18 bars if made in a larger pan! The smaller the pan, the bars result thicker than expected, allowing you to layer the chocolate and coconut, creating a chewy and rich bar! What would be three ingredients in YOUR dream treat bar? These look insanely good. I am pinning them to my must make soon board! Thanks for the Brown Sugar, Coconut & Chocolate Bars recipe. If you don’t mind, can I submit your Brown Sugar, Coconut & Chocolate Bars photo in http://www.foodporn.net ? These have 2 of my favorites, coconut and dark chocolate. I would add almonds or walnuts if I am being good. Or, I would add marshmallows if I am being bad. 😉 I can’t wait to bake these (modified to be gluten-free of course). Thank you for sharing this scrumptious recipe with all of us. These look so.good. I love gooey, chocolate bars. My dream bar would have some coffee in it as well. Woah! 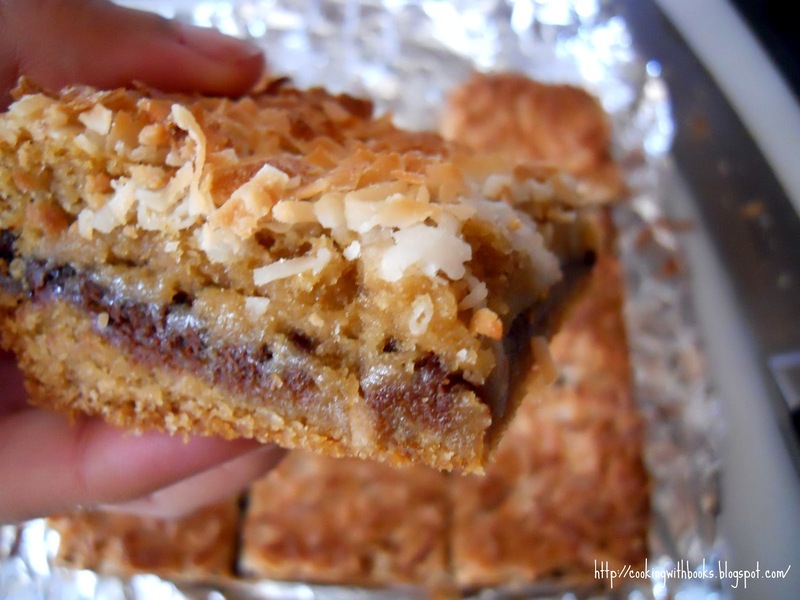 I love coconut and chocolate in my bars! These look divine Nelly! Wow, these bars are PACKED with all sorts of good stuff. Can’t wait to try this! YUM. I would love to eat anything you baked but these sound especially yummy. Oh my sweet freaking god! This looks absolutely sooooooooooo good! I’m going to make this right away! Thanks for sharing the recipe. Lovvvvvveeeee this! Yummmm; not even out of bed yet and wish these were waiting for me downstairs. Just a great combination of ingredients. So, if I had my perfect three. Well…brown sugar, booze and bacon? I so love the notion of bartering; there is a swap group in Denver…you go taking your goods and barter with other vendors for theirs. I took wood butter and got cookies, biscotti, lavender bitters, granola and more. It is fun! and i think bartering is so neat. that’s like what they did back in the colonial days in america!!! my dream bar would be banana, chocolate, and peanut butter together. hehehe. i’ve never made a layered bar before! okay, press cookie dough in, layer with chocolate, and then layer with more cookie dough. got it! oh baby, you made these just for me, didn’t you? You knew I was craving chocolate and coconut? LOL it wasn’t me – it was the mister. I’ll make these this afternoon and tell him they were from you. Yes, those would work as well! Oh yum! I saw the name of the recipe on Twitter and knew I had to check this out. I can imagine you could get a lot done with these treats as payment! I have died and gone to snack heaven. I have all the ingridients! Yummy here I come! Somehow, somehow horrible, I’m out of brown sugar, coconut and chocolate! Ah! I will have to get some next time I go to the store. Those look so rich! I think I could eat the whole pan by myself! these sound awesome + look absolutely delicious – yum! Oh my goodness do those bars look good! These would, without a doubt, be my dream bar. No contest here! I’ll take one with my coffee!